I’ve written a lot about using more than one Bible. I even have a guest post on Bible Design Blog about this very topic. In my opinion, a Bible that’s designed for a special purpose, such as reading or marking, is better for its specific purpose than one Bible that tries to do everything. With that said, there are times when it makes sense to use an all-purpose Bible. An all-purpose Bible is a multi-tool. Multi-tools are useful, but they’re not as good at each task as a tool made just for that task would be. I believe specialized Bibles are better suited for their purpose, but it’s not always realistic to have more than one Bible. Sometimes you need a single Bible that can be used for everything. In this article we’ll figure out how to choose an all-purpose Bible. First, why would you need an all-purpose Bible? There are lots of good reasons and my reasons might be different from yours. The first thing that comes to mind is going into the mission field. Another reason would be going on a trip and you have limited space. Maybe you have limited space at home. Perhaps the number one reason is budget. Having lots of Bibles is great, but that can be expensive. Maybe you just want to get to know and grow with a single Bible that’s your personal friend. A Bible you’re more familiar with is easier to use. There are lots of ways to choose an all-purpose Bible. I prefer to choose based on my personal needs. I find it helpful to make a list of those needs. Make a list with two categories. The first will be a list of features you can’t live without. The second would be a list of features you’d like to have. 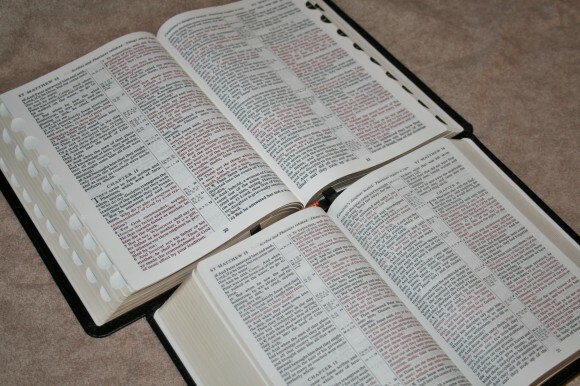 This list will help you narrow down which Bible best fits your needs. I have to warn you though… finding a Bible that has everything on your list can be frustrating. This is why it’s important to be as honest with yourself as you possibly can about your lists. Within both of your lists you’ll describe the features such as font, paper, size, etc. Choose for yourself which are your priorities. Be as specific as you can within your lists, but also give a range that you can live with. Instead of a 10-point font, maybe you can live with a 9 or 11. Here’s what my current list would look like. I’ve made some notes explaining my choices. I recommend adding your own notes as it will help you thing though your process. Cover – anything that will last and lay completely flat in Genesis 1. No stiff tabs, cover must stay all the way open. Dark font – medium to dark. Paper – 30-32gsm, highly opaque, easy to turn. Once you have your list, take a look at Christianbook, Amazon, review sites, and Facebook groups to see what comes the closest to your needs. Most likely you’ve already tried to find an all-purpose Bible. There’s a good chance you’ve gone through a lot of Bibles and are still looking for “the one” – that one perfect Bible that solves all of your needs. Trust me – chances are high that Bible doesn’t exist. Why? For one thing your needs change over time. What I needed in a Bible 20 years ago is different from what I need in a Bible today. My ministry is different today (as a pastor) than it was 20 years ago (as my pastor’s helper). The first difference that comes to mind is font size. Another is block size. Another difference is use; I now need to carry a Bible to preach from. Another thing that comes to mind is tools. Now we have access to tools online, in e-books, on our phones or tablets, and in massive libraries within Bible study apps. We no longer need our primary all-purpose Bibles to provide us with everything we need. We just need to have what we use the most. 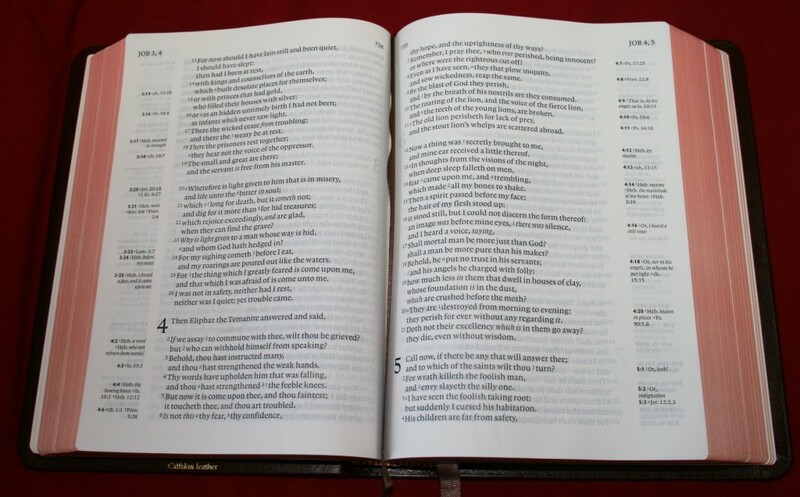 Although I think it’s best to use a Bible for a specific purpose (reading, carry, study, marking, preaching), I also think we need an all-purpose Bible. 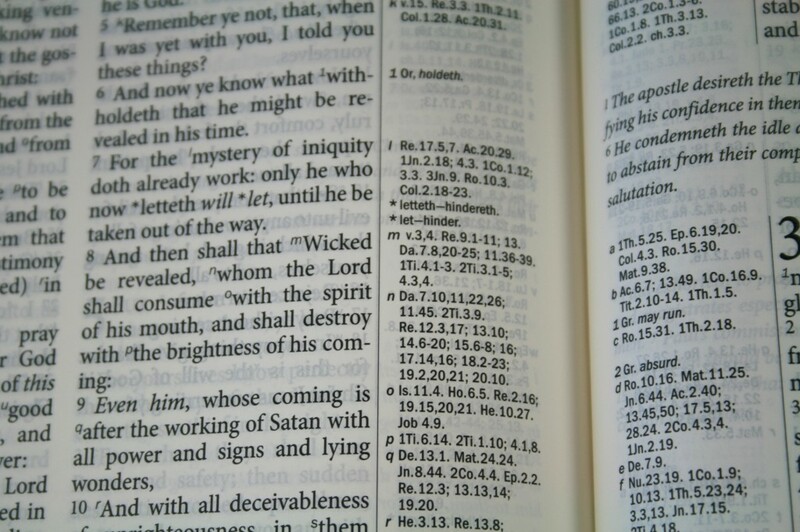 An all-purpose Bible should be easy to carry, easy to read, and have some basic study tools. This Bible might end up being the one you use the most, but it doesn’t have to have everything in it – just enough to get you by based on your needs. If it doesn’t fit your needs you won’t use it. If you don’t use the features it contains then you probably should reconsider your list. You might even need to revisit your list as your needs change over time. Your needs will be unique to you. Be as honest with yourself as possible about what you really need. Use this list as your starting point and you might just end up finding the best all-around Bible for your everyday use. The idea of a general purpose Bible is definitely appealing in today’s hurried environment. As we read the Word, we hope to find a way to have a physical “presence” of the Word in our hands at a moment’s notice. What I like about your Bible (literally the Book, not a set of tutorials about ) series, is that it’s like a set of reviews of a product. Not to diminish the need for tools of discernment, but the feedback on what works best for your purpose is really cool. Me, I’m happy with maybe a huge 4 translation (because I’m a language geek and I love learning subtle variations). Cross references are also super important to me. One day, Randy, we’ll have VR access to any translation, any purpose set of tools. No matter if you are at your desk studying, or in a mission field. That will be a blessed day. Thanks Terry! 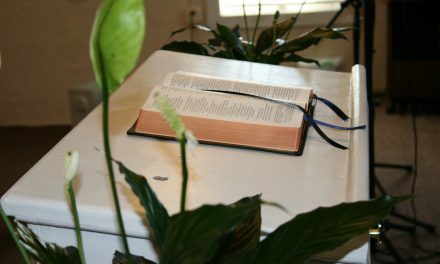 I love the sound of a VR Bible library that can be used anywhere. I’ve actually had that in my mind for a while. I don’t think that’s far away. If only I could find one with the paper and text size of the ESV Reader’s Bible (6-volume) but just one, personal-sized book. Ah, the search continues. That would be an amazing Bible! I have only 4 requirements for the Bible I am wanting to find: King James version, at least 11 point print, references, and at least 2″ margin. Several have three of my requirements, but finding all four has so far been unsuccessful. 11 pt. font with 2″ margins? I’d start looking for an “all-propose backpack” to carry that thing around in. 🙂 Hope you find it! The Thompson Chain Reference is the one for me. It’s bigger than I would dream of, but it’s worth it for the study helps. 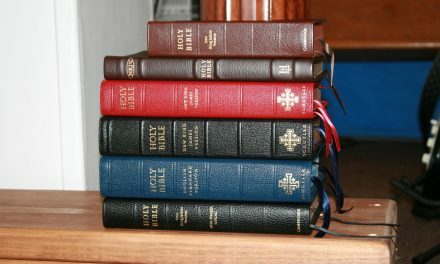 Thats the goal for me, is something I can study from at home and on the road (eliminates Study bibles, too big), lays flat so can write use other items, and take into jails/restricted places (you can’t take iPad into certain places, only paper allowed), but also needs to be big enough to read from standing at pulpit.